Mate contains an alkaloid called mateine, which acts much like smooth caffeine. Additionally, it is believed to act to assist dieters in reducing food cravings and by helping you feel fuller, longer. 77 78Drinking yerba mate herbal teas as part of a diet for weight loss is one of the best ways to reduce calorie intake while consuming a healthy beverage. Unlike diet soda, herbal diet tea contains no chemicals and artificial sweeteners. Yerba Mate Side Effects: Judicious use of this tea just may be one of the most effective, and healthiest diet aids available, only the over-stimulation by the alkaloid mateine limit it's use. Those who are not fazed by strong coffee should be fine. 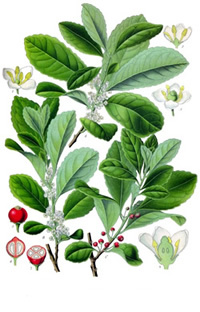 Yerba mate is the dried leaves and stems of a South American holly and like other members of the holly family, the mate tree has bright red berries and shiny green leaves. The term mate is a Guarani Indian word for gourd, referring to the hollowed out gourds once used as cups to drink the tea. Holly leaves were once used in traditional herbal teas, but South American holly, Yerba mate is much better known and widely used. Like other members of the holly family, the mate tree has bright red berries and shiny green leaves that make a very Christmas-y looking plant. Try drinking a cup of yerba mate to help you gather some non-nervous energy to make it though the holidays. 77. Kyoto Pharmaceutical University. "Mate Tea (Ilex paraguariensis) Promotes Satiety and Body Weight Lowering in Mice: Involvement of Glucagon-Like Peptide-1. (2011)"